(Nanowerk Spotlight) Imagine cellular phones that can be charged during conversations and sound-insulating walls near highways that generate electricity from the sound of passing vehicles. A number of approaches for self-powering systems by scavenging energy from environments using photovoltaic, thermoelectric, and piezoelectric phenomena have been intensively explored. Among them, very recent innovative research has been intensively carried out to convert external mechanical stimuli such as body (human or animal) movements, gas flow, heartbeat, blood flow, and ultrasonic wave into electricity, resulting in piezoelectric power-driven wireless self-powered systems (see for instance: "Electricity-generating silicone implants could power electronic devices"). Such a piezoelectric power generation aims to capture the normally wasted energy surrounding a system and converts it into usable energy for operating electrical devices. New work by a nanotechnology research team in Korea has now demonstrated that it is possible to use sound as a power source to drive nanogenerators based on piezoelectric nanowires. "We are surrounded by sound – speech, noise or music – in our everyday life" say Dr. Jong Min Kim, Director of Frontier Research Lab, Samsung Advanced Institute of Technology (SAIT) and Sang-Woo Kim, a professor in the School of Advanced Materials Science & Engineering at Sungkyunkwan University. "But sound is a form of mechanical energy and could potentially be used as a source for piezoelectric power generation. There should be a way to turn sound energy from speech, music or noise into electrical power. This has motivated us to realize power generation using sound-driven nanogenerators based on piezoelectric zinc oxide nanowires." In a previous Nanowerk Spotlight, we have reported on their work on using large-scale graphene sheets as transparent electrodes for fully transparent and flexible nanogenerators ("Flexible nano-power with fully transparent and rollable graphene nanogenerators "). In this new work, Jong Min Kim and his collaborators report the first power-generating performance of sound-driven nanogenerators based on piezoelectric nanomaterials. 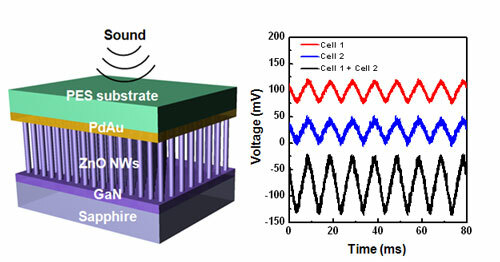 The research appears in the August 30, 2010, online issue of Advanced Materials "Sound-Driven Piezoelectric Nanowire-Based Nanogenerators". "Sound is a regular mechanical vibration that travels through matter as a waveform" explains Kim. "Longitudinal sound waves – compression waves – transmitted through the ambient air are made up of waves of alternating pressure deviations from the equilibrium pressure, causing local regions of compression and rarefaction. In our work, the intensity of the input sound was ∼100 decibel (a normal conversation is about 60-70 decibels). Compared with other mechanical energy sources such as motion from heartbeat, blood flow etc, it is very difficult to use mechanical energy from sound in order to generate electrical energy using a conventional PZT-based bulk or thin film piezoelectric energy harvester." To overcome this difficulty, the team worked with zinc oxide nanowires, a piezoelectric nanomaterial that leads to a much more sensitively response toward sound energy. Schematic of a sound-driven piezoelectric nanogenerator based on zinc oxide nanowires and its power-generating performance. The flexible PdAu-coated PES substrate acting as both a top electrode and a vibration plate was installed above the ZnO nanowire arrays (Image: Dr. Jong Min Kim, SAIT). The sound wave was used to vibrate the top contact electrode (see schematic above), which generated electric potential through the vertically well-aligned zinc oxide nanowires. When sound with an intensity of ∼100 dB was applied to the nanogenerator, an AC output voltage of about 50 mV was obtained from the nanogenerator. A the initial stage of this work, the research team was struggling with the question of how to effectively and directly transfer the sound energy to the nanowires causing compressing and releasing of the nanowires. The solution they came up with is the current device structure where a sound wave can strike the palladium/gold-coated flexible plastic substrate acting as the top electrode, thereby causing Schottky contact formation to the zinc oxide nanowires. In addition, the palladium/gold-coated flexible electrode also acts as a vibrating plate toward sound, so the mechanical vibration of the flexible electrode generated by the sound wave is directly transferred to the vertically aligned nanowires. "However" says Kim, "the surface roughness of the plastic substrate is not entirely uniform. Thus, the output performance can be significantly changed since the contact probability of zinc oxide nanowires to the top electrode is affected. In addition, 50 mV obtained from this work is not a lot of power. We believe that we can realize more efficient sound-driven nanogenerators by replacing zinc oxide nanowires as a new piezoelectric nanomaterial with a higher piezoelectric coefficient." Applications for sound-driven power generators are numerous. Sound power could be used for various novel applications including cellular phones that can be charged during conversations and sound-insulating walls near highways that generate electricity from the sound of passing vehicles. The latter development would have the additional benefit of reducing noise levels near highways by absorbing the sound energy of vehicles. At the moment, though, the biggest issue for the team is the power generating performance of their device. "Of course" says Kim, "current output performance is good enough to be applied to various electronic devices with low-power consumption such as self-powered sensors, e-papers, or body-implantable tiny devices. However, if we can improve the output performance of our nanogenerators much higher, it will make a significant impact on the 'green energy' field. This is the reason why we and others are trying to develop new nanomaterials with much higher piezoelectric properties, overcoming the limitations of zinc oxide, and ultimately leading to the design of improved nanogenerator with increased piezoelectric performance.